A recent motorcycle accident in Randolph landed a 62-year-old man in the Boston Medical Center. The man was injured after colliding with a motor vehicle at the intersection of Pond Street and North Main Street at approximately 4 p.m. Traffic was slowed and rerouted through a detour while the accident was investigated, according to Enterprise News. Our Boston injury attorneys ask that all motorists keep an eye out for motorcycle riders during these last few weeks of riding season. Riders are unable to navigate our roadways year round, so when the weather permits, they hit the open road in full force. Unfortunately, motorcyclists are extremely vulnerable to serious injuries in the event of a traffic accident. Typically, these motorcycle riders are often overlooked by car and truck drivers because of the bikes’ smaller size. Motorists are asked to remain aware of their surroundings to help keep our riders safe while they’re still able to ride. The Massachusetts Department of Transportation (MassDOT) has conducted a number of studies on the dangers and riding techniques of our motorcyclists. Transportation officials understand the risks that these motorists face for a serious accident on our roadways and are making strides in helping to preserve their safety. 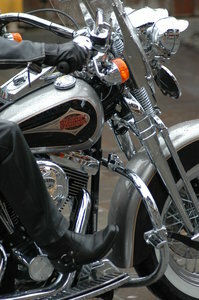 -A vehicle makes a left-hand turn in front of a motorcyclist. -A motorcyclist gets stuck in a vehicle’s blind spot. -A motor vehicle follows too closely behind a motorcycle. -Turn signals are not used. -You fail to acknowledge road laws. -There are dangerous road conditions, including railroad tracks, wet leaves, potholes and other obstructions. -Your line of vision is obstructed. Oftentimes, sport utility vehicles, commercial trucks and delivery vans can block a motorist from seeing a motorcyclist. -Remember that motorcycles can easily be overlooked on our roadways. -Our eyes are conditioned to spot other passenger-vehicles. Take the extra time to watch carefully for motorcyclists and other travelers in smaller vehicles. -Be aware of the road, traffic and weather conditions, all three of which require drivers to be extra vigilant. Motorcyclists also have to adjust their driving skills. During these times it can be difficult to judge and predict when riders may take evasive action. -Check twice, save a life. According to the National Highway Traffic Safety Administration, of the 334 roadway fatalities in Massachusetts in 2009, approximately 54 involved motorcyclists. A number of these accidents, both of passenger-vehicle and of motorcycle riders, can be reduced and potentially prevented if we all take a look at our own driving habits and make a conscious effort to make them more aware, more cautious and more defensive. If you or a loved one has been involved in a motorcycle accident in Boston, the injury lawyers at The Law Offices on Jeffrey S. Glassman offer you a free and confidential consultation to discuss your rights. Call 877-617-5333 or contact us through the website.